**Obsolete** Use cell FC37A1064 as replacement. FC37A1171 20 x 12½ x 4½" used in the F52 series only. Genuine Honeywell electronic air cleaner cell. Note, Honeywell 2000 cfm 20 x 25 F52 units use two cells. Assembled with ionizing wires and ready to slide in and use. Honeywell cells are symmetrical so they can be used with air flow going right or left. The cell is simply flipped around for the opposite air flow. Includes one plastic handle 137266. The handle can mount on either end of the cell allowing the cell to be rotated and used with air flow running in either direction. Determine the side of the cell that will be facing out before installing the handle. Since 1975 all F50A F50E F50F F300 use cells listed in the first 4 tabs above. The FC37A1171 is only used in the F52 grille mount. The current production cells are the same as the early cells that had the red fiberglass contact pad. The FC37A1171 Honeywell cell can be identified by the part number stamped in to the aluminum. The text Honeywell Residential is stamped in the end facing out and the part number is stamped in to a side edge, see photo below. One cell used in F521048, two cells are used in F52F1052. Used in all F52F F52E F52D F52C return grille models. The handle swings in to place and snaps in. Be sure to also snap down the locking tab. Click photo for detailed instruction. If a cell is sparking, determine the sparking area and removed cell to inspect closer. To see the sparking, you may need to look in through the blower compartment or cut an inspection hole in the duct. An inspection window can also be used to see if cells need to be cleaned. A cell that is sparking randomly throughout is uncommon but could be caused by a film left behind from washing. If tobacco is not cleaned from a cell it can build up and cause random sparking. Diesel fumes can cause problems and are not easily cleaned. 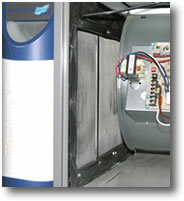 High altitude can make the air cleaner more susceptible to sparking. The collector plates should be cleaned to the bare shiny metal (stained is okay). Major cell sparking can be the result of power box wires getting crossed. The cell is powered by two voltages. The ionizing wires receive 8kv and the plates get 4kv. If these voltages get crossed, then the cell will spark all over and much louder than normal. If a cell is shorted and keeps the neon lamp from coming on, then inspect for damage. 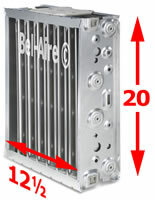 The most common short is from the aluminum dividers in between the ionizing wires. These dividers can get pushed in to the collector plates, they should not touch the plates. A dent across several plates causing them to touch would be a simple short to find. A dandling ionizing wire can cause a short. The 4074EHG tabs make contact with the edge of every other cell plate. Photo right shows the edges of the plates burnt down far enough, that the contact shorts against every plate and not every other. Honeywell cells can last for decades, but continuous sparking can cause damage. A cell may spark continuous if collector plate spacing gets too close. The spacing can become uneven when a cell gets pushed out of square, twisted, a dent, etc. One common problem is a loose plate that has lost the press fit with its horizontal rods. The loose plate likely had continuous sparking that created surges of current through the press fit. The current surges resulted in sparks that brunt away the press fit. This cell would not be repairable. When one cell has been subject to excessive sparking, then both cells will be burnt under the contact pad. This is because a spark in one cell will cause a current surge that is drawn from both cells. Check the contact pad to determine the condition of the cell. 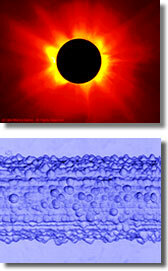 If your cells have badly burnt contacts as in the photo above, then it is best to replace the cells. When a cell has been subjected to excessive sparking, the press fit of all the plates will first be weakened. The sparking at these connections causes corrosion from ozone. The aluminum around the press fit becomes corroded and no longer conducts as well. The cell contacts operate at high voltage and are not a sensitive connection. The contact does not require cleaning. The contact is tin coated copper. Sandpaper will remove the tin coating. The photo below shows arcing under the contact pad. You may have noticed there are 3 contacts on the cell pad but only two contacts at the power box. 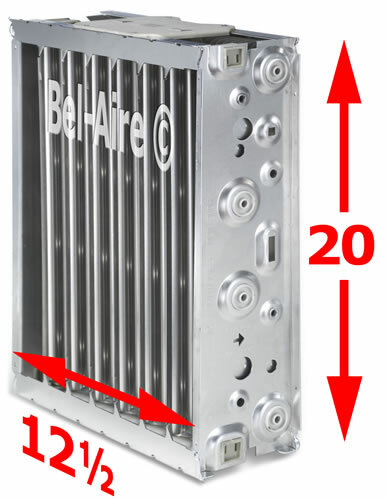 This allows the F50-F300 to be installed with either right or left air flow. The cell can be rotated allowing an installation with opposite air flow. Only two contacts are used, the center contact and one end contact. Photo animation shows when the cell is rotated, the contacts maintain the correct connections. The center contact powers the ionizing wires. The two outside contacts are connected and power the collector plates.